Looks like the rain may hold off for tomorrow's Easter Egg Hunt! Stop in to the next Planning Board meeting to talk about the Wurtz Funeral Home property plans! Be prepared for work on our Rt 219 bridge plus the Newton Rd Bridge this summer - the NY Dept of Transportation will be putting up the orange cones! The Equine Collaborative International (ECI) is collecting non-perishable food items at Town Hall to benefit the Food Bank of WNY! The Food Bank serves 5 Western New York Counties including Erie County and favorite donations are peanut butter, dried beans, and canned soups. ECI is proud to help you help your neighbors - please be generous! The Town Highway Department has wood chips galore. Contact them for delivery - great for landscaping and around bushes! Residents of Our Town have organized a Town-wide garage/yard sale! Click or tap here to see (and print) the signup form (must be returned by Friday April 19th so they can plan)! Our Town Highway Department will start picking up brush starting in April through the end of May - they'll cover each road once each month! They'll pick up leaves too, but they need to be in bags - they won't pick them up otherwise! 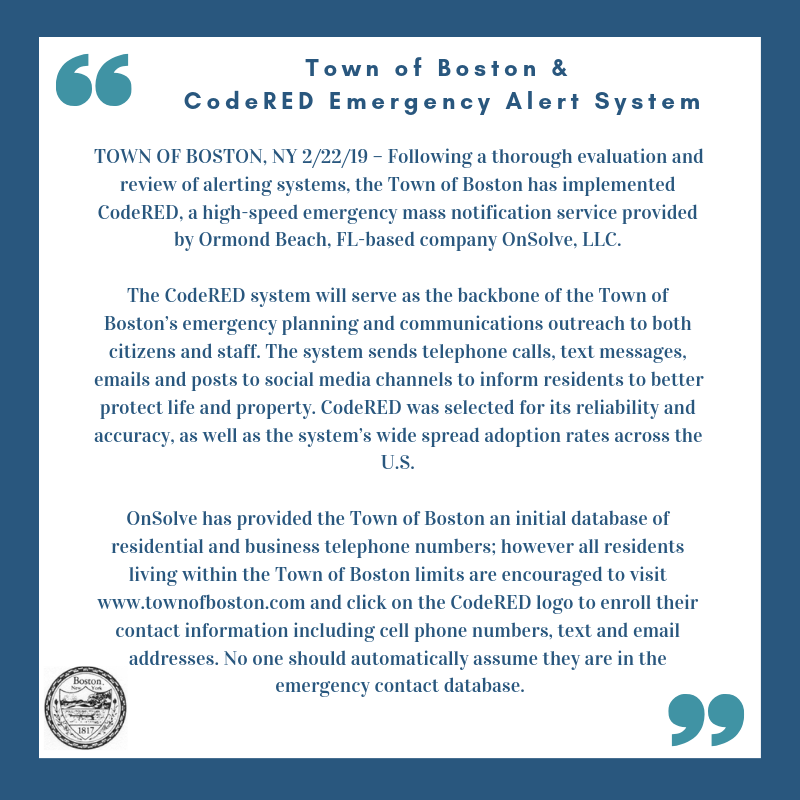 The Town of Boston has subscribed to OnSolve's CodeRed system - tap here on your smartphone for the link to subscribe and download! Click or tap here for the statement from Our Town! Our Boston Town Band is holding rehearsals for their 27th season (click or tap here) - contact Herb Klein at 649-8570 for details! Check out the Thank A Vet Discount program - click or tap here for times and locations! There are literally hundreds of businesses involved - click or tap here to see the list! Please be sure to have your refuse and recycling at the roadside for pickup by 6:00am on your regularly scheduled pickup day! Please use these links and phone numbers if your power goes out - the power companies don't know if you don't tell them! Click or tap here to see the Erie County Road Status map - the red X's are "problem" spots!